This week’s blog is actually a ridiculously long rant disguised as a blog. 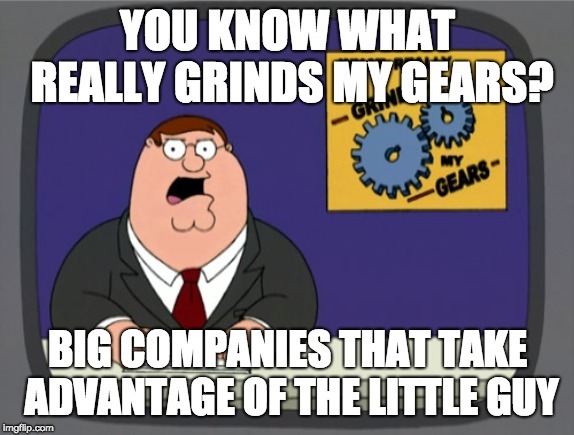 But, who doesn’t love a good rant, so here’s what really grinds my gears this week. I paid Spectrum what I owed them in full. They accepted that payment. Then, they turned off my internet. My internet had been spotty at best for a couple months. Sometimes websites would load in 2 seconds, other times they would load in 30 seconds, and sometimes they wouldn’t even load at all. One day I’d finally gotten frustrated enough to call Charter Spectrum to find out how to fix my internet. The tech support person at Spectrum was quite helpful. He could see things like which computer I was using, whose phone was currently connected to the internet, and other creepily intrusive information. After changing a few settings on my modem my internet seemed to be working perfectly for the first time in months, maybe ever. Spectrum still insisted on a tech coming out just in case that fix didn’t last……and it didn’t. The next day the same issues with the internet were back. So, I made sure I was home the day Spectrum sent someone out to check the wiring. At this point, I feel I need to go back to the day I called Spectrum though. After the tech had completed his remote repairs, I had him transfer me to someone who could adjust my bill to compensate for the time when my internet was working slowly or not at all. I hadn’t even thought about asking Spectrum to discount my bill until the tech brought it up himself. But, after he brought it up, I realized that I wasn’t getting what Spectrum promised when I agreed to their terms originally. I wasn’t getting lightning fast internet speeds; I was getting the slowest internet signal around if I was getting a signal at all. Plus, I had just spent 30 minutes of my evening dealing with the issues that had been bothering me for the last few months. When the Spectrum billing rep asked me what she could do to help, I posed the question to her: “How much would you pay for internet that takes 10-30 seconds, and occasionally longer, to load a page?” Her response was “That’s a good question.” I then said, “I know, that’s why I asked it.” Then, she didn’t want to ask the question. Finally, I got a response of “probably, not very much.” At least I had made her realize why I felt my bill should be discounted. The rep after agreeing she wouldn’t pay very much for internet like that, stated she could give me a $10 discount to make up for it…….A $10 discount? For internet that hasn’t been working correctly for months? I told the rep that I felt like that discount was disproportionate to the quality of internet I had been receiving for the last few months. This is the point when I became agitated. The rep told me that if I actually had problems I would have called months ago the second the problem started. She told me, without explicitly stating so, that I was a liar and if I had been having this problem for more than a day, I would have jumped on the phone immediately and spent an hour on the phone with spectrum. I tried to explain to her that it was not a priority to me because I’m a patient person and I had not been frustrated enough to take time out of my schedule to call about the issue. As my frustration grew with this complete stranger who supposedly works in the service industry calling me a liar, I explained further that I had started my own law firm at the beginning of the year and simply had not even had the time to spend an hour of my life talking to someone like her. (I may have been a little rude at this point, but I felt it was warranted considering a complete stranger was calling me a liar to my face/phone.) Finally, I realized this was going nowhere so I asked to speak to someone else who could help me. She told me there was no one else. Finally, after explaining that I do not have a boss and that I probably generally live in a different world than her, she connected me with her boss. Sadly, this was equally futile as the new rep stated he would not do anything different than the $10 discount as well. He backed up his associate’s position and agreed that everyone would call the very day they had a problem so they could not compensate me for anything but $10. I wasn’t even going to bother having this conversation again. Finally, he stated he would have someone higher up contact me to resolve my issue the next day. Still waiting for that call several weeks later…..I don’t think it’s coming. This whole process made me realize that Spectrum isn’t selling a service, they’re selling a product, and it’s a product they know I need. They also know they’re basically the only game in town so I have to do whatever they want. The check cleared my account three days ago. Today, Spectrum turned off my internet. No communications from Spectrum prior to doing so other than two text messages telling me my bill needed to be paid in order to avoid service interruptions. Maybe they just wanted me to call and say hi again. Maybe they think I’ll give them whatever they want because I need internet in order to work. Maybe they’re just too big to care. All I know is they have lost a customer for life due to their poor customer service. Frontier will be setting up my new internet service this week. I can’t wait for Elon Musk’s satellite wifi to be available.